The bias of a piece of woven fabric is at 45 degrees to its warp and weft threads. 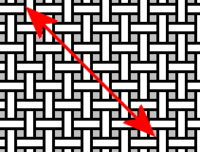 Every piece of woven fabric has two biases, at right angles to each other. Fabrics which are not woven, such as felt, do not have a bias. When cut on the bias, woven fabric is more elastic as well as more fluid in movement, compared to the on-grain direction. This helps many types of garment, such as skirts, dresses and neckties. The "bias-cut" is a technique used by tailors and dress-makers for cutting cloth. The greater stretch in the bias (diagonal) direction of the fabric, helps it accentuate body lines and curves and drape softly. For example, a full-skirted dress cut on the bias will hang more gracefully or a narrow dress will cling to the figure. Bias-cut garments were prominent in haute couture clothes designed by Madeleine Vionnet in the 1920s. It is still used often in both haute couture and high street clothing. In the Middle Ages, before the development of knitting, hose leggings were cut on the bias in order to make them fit better. This page was last changed on 24 August 2014, at 19:33.